Highclere Castle is a spectacular setting to hold a private luncheon or dinner. 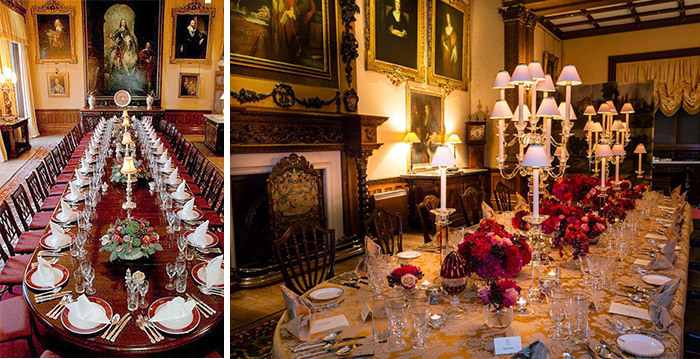 Dining at Highclere can mean a quiet dinner party in The State Dining Room for a dozen people or a dinner for up to 120 guests in the opulent Library. Larger numbers can be catered for using a marquee within the beautiful grounds. We are delighted to be able to offer you the option of hiring the Castle exclusively for your guests to experience a private tour of the State Rooms, Castle Bedrooms and Egyptian Exhibition. Our guides have exceptional knowledge of the building, artwork and furniture with anecdotes to match. We are able to tailor your private tour to compliment your group size, interest and the time of year you hope to visit.